That superlative goes to Tristan Rennie. Tristan is a skater in his teen and is one of Salba’s protégé. He also rides for SalbaCruz (a division of Santa Cruz). 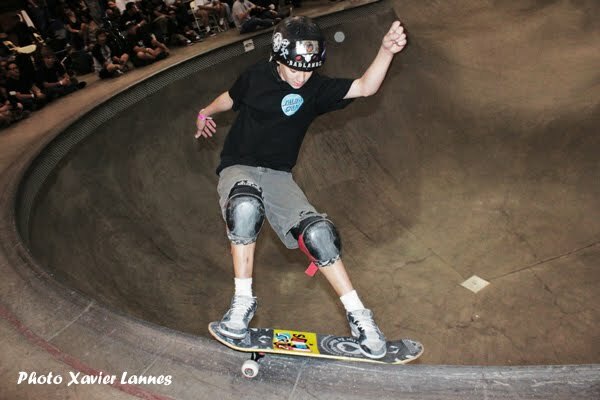 Tristan is amazingly good at skating pipes and pools and his recent demonstration at the Ams Combi Pool Classic at Vans left a couple of people in awe… This Salba video celebrating his birthday last WE is also about Tristan’s skills. Take a look at it, there is a nice part with Tristan and you’ll understand why he belongs to the future of skateboarding. Funny how you start a story with Salba and you end with Tristan Rennie right?